Dress with full gathered skirt may have high neckline with Peter Pan collar or bateau neckline with wide collar. Short puffed sleeves or short sleeves with cuffs. Buttons run from neckline to hem. A good dress to show off some extra special or unique buttons. Self fabric belt. Girls Size 6, Breast 24, Waist 22. The pieces have been neatly cut and folded. Envelope is clean and solid with some light storage wear to edges. 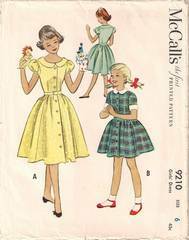 This an original vintage sewing pattern from 1952.